David Christopher Rees qualified as a doctor in 1994 from the Royal Free Hospital School of Medicine, University of London. Prior to this he undertook an intercalated BSc(Hons) degree in ‘Biological and Clinical Science’ in 1992 at St Mary’s Hospital Medical School. After House Officer positions at the Royal Free and Hemel Hempstead Hospitals Mr Rees obtained full registration with the General Medical Council (GMC) in 1995. As a Senior House Officer in Surgery, Mr Rees worked at the Hammersmith Hospital, the Royal Brompton Hospital and the National Hospital for Neurology & Neurosurgery all in London as part of his basic surgical training. In 1998 he obtained his FRCS (Fellowship of the Royal College of Surgeons of England) examinations before commencing his Specialist Registrar training in Trauma & Orthopaedic Surgery based at the internationally renowned Royal National Orthopaedic Hospital (RNOH) in Stanmore, Middlesex. In 2004 Mr Rees was awarded a highly competitive ‘knee fellowship’ by the British Association for Surgery of the Knee (BASK). 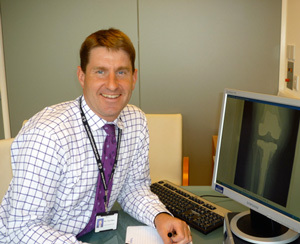 It was during this year that he consolidated his experience in reconstructive knee surgery including arthroscopic cruciate ligament reconstruction, revision knee replacement and computer assisted knee surgery at the Derbyshire Royal Infirmary, Derby and the Queens Medical Centre, Nottingham. In 2005 Mr Rees passed the FRCS(Tr & Orth) examination, was awarded his ‘Certificate of Completion of Specialist Training’ in Trauma & Orthopaedic Surgery and was granted Specialist Recognition by the GMC. In early 2006 he was appointed Consultant Orthopaedic Surgeon with a special interest in knee surgery at Broomfield Hospital in Chelmsford, Essex. Mr Rees has several published papers to his name and is heavily involved in Medical Education and Surgical Training. He has taught on surgical skills courses organised by the Royal College of Surgeons (RCS) of England and lectured on many courses run at RNOH, Stanmore. Mr Rees is one of the RCS Assigned Educational Supervisors at Broomfield Hospital and oversees the training of junior surgeons.